Sensor technology and data analysis can be used to improve energy efficiency and reduce energy expenses for churches and other places of worship. The following case study is an example of how one church is using room temperature sensors to lower its utility costs dramatically. This example is of an Episcopal church located in Texas. It is a single-story structure consisting of five areas: the worship space, offices / meeting rooms, parish hall, kitchen, and a classroom wing. The classroom wing consists of eight classrooms and houses a preschool, as well as other church activities. The total structure size in terms of floor area is roughly 17,000 square feet. It is heated and cooled with electricity. The story begins with a soda vending machine, now located in the church’s parish hall. The hall is used almost daily for meetings, lectures, receptions, teaching and meals. An audit by a professional energy service company indicated the soda machine might be consuming a disproportionate amount of energy. In addition, frequent loud and disruptive noise from its compressor during events also raised the possibility it should be removed. The question: how much energy was this machine actually using? At the request of church leadership, Hartford Steam Boiler (HSB) installed a current and voltage sensor accompanied by an internet gateway to capture energy use data in real time. Energy use data was collected for several months to ensure a representative sample. Moreover, because the first installation was in December, energy use in warmer months was required to observe the sensitivity of the machine’s energy consumption from warmer room temperatures. HSB engineers noticed the vending machine was running for long periods of time, even when it was not in use. The church re-programmed the sensor’s timer from the user interface to reduce operational hours by 50 percent, running the machine from 7 a.m. to 7 p.m. This simple action likely increased the machine’s useful life and cut the energy costs. It also eliminated the noise issue completely for meetings after 7 p.m. It was determined from the sensor readings that the vending machine’s annual energy costs are less than $45, and revenue earned from sales and convenience are greater than the cost. That answered the question of whether the machine should be removed; church leadership kept the vending machine in place. The real energy savings story focuses on the signal repeating device and temperature sensor installed by HSB engineering, along with the vending machine sensor. The parish hall has the most diverse and active use in the church complex. Users often changed thermostat settings to their immediate, perceived comfort levels. These settings were often higher or lower than comfort levels under the misconception that the greater the change in setting, the quicker the change in temperature. For example, room users would lower temperatures and then, during meetings, put on sweaters. Often after meetings, the thermostat temperature was not reset. It was apparent to the church leadership that people were changing the room temperature without appreciating the energy and cost implications. Up to this point, the church thermostats were manual devices, and the church or meeting leadership was responsible to ensure that the set temperatures were acceptable for meetings and turned down afterwards. To reduce this dependency on human behavior, programmable thermostats and lock boxes were installed at about the same time as the vending machine analysis was performed, late in 2014 and early in 2015. These actions had little effect on energy use because people continued to change the temperatures on the new thermostats, getting around the lock boxes by obtaining their own keys and not changing their behaviors. When HSB installed the signal repeater and temperature sensor, hall temperatures were recorded, and the data stored and analyzed. Church leaders could see when temperatures were changed, contact meeting organizers and remind them about energy policies. At the same time, church leaders were better able to inform building users of actual costs and savings. Once parishioners could better understand the long-term energy cost implications, compliance with energy policies improved. Analysis showed that over the last two years when temperature sensor data was being monitored, there was a 26-percent reduction in actual energy consumption and an 18-percent increase in energy use efficiency. These results represent significant cost savings in thousands of dollars annually for the church. Ongoing monitoring is necessary to maintain the energy savings. Sensors and data analytics are tools to provide a basis for decision-making. The majority of energy efficiency and energy savings come from people paying more attention to energy use. Users of the church complex — both church attendees and outside meeting attendees — need to be accountable for maintaining appropriate temperature levels. Some automatic energy savings can be achieved by programmable devices — but this a small part of the overall available opportunity. Machine learning temperature sensors might have difficulty in adequately adapting to a church’s diverse schedule in a volatile weather environment. 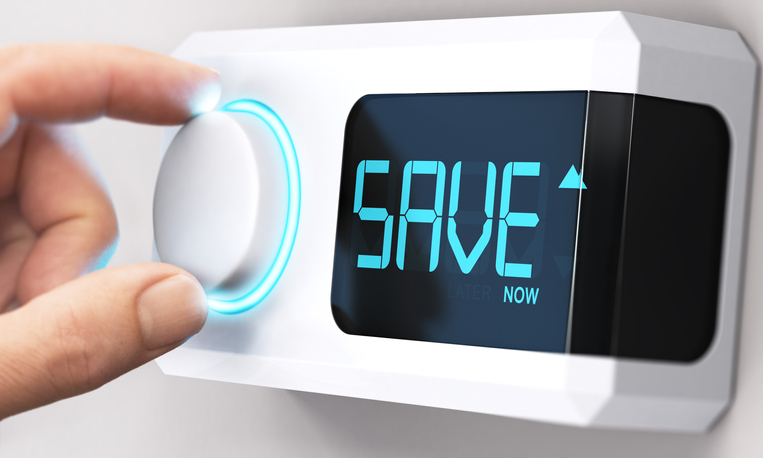 The energy efficiency improvements have the immediate positive effect of reducing costs and the longer-term benefit of longer equipment lifetimes. In conclusion, there are some situations where energy and cost savings are based purely on technology. For example, traditional lighting expenses can be reduced by converting to LED units. This case shows that significant cost savings have been seen without investing in new energy equipment, but rather by changing behavior. In this study, the room temperature sensor data provided an unbiased view of energy use / abuse that was clearly and regularly reviewed by church management with its results communicated to the building’s users. The data provided specific direction for correcting problems of careless use of the building’s heating / cooling / ventilation systems. Over time, people became aware of their responsibility and the actual effects of their behaviors, and energy efficiency increased. This feedback mechanism is simple and was enabled by the unbiased data from the sensors and regular user follow-up. Like many improvement processes, communication of behavioral expectations and feedback were the critical elements that made this sensor deployment successful. Richard Jones, Ph.D., is senior vice president of engineering and research at The Hartford Steam Boiler Inspection and Insurance Company (HSB).